This unfortunate was the mascot of a local sports team on the day the Zombie Apocalypse. After getting the stuffing eaten out of him, he chased the hometown crowd around the stadium. 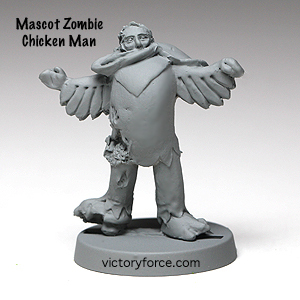 This is a very popular VFM Zombie Figure and it can be found in the Victory Store in the Creatures Section. This entry was posted in Spotlight and tagged 28mm, creatures, miniatures, spotlight, zombies. Bookmark the permalink.